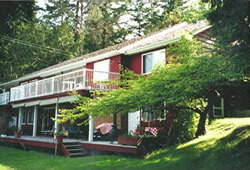 Goose Trail Bed and Breakfast is located on picturesque cooper's cove. There are natural views overlooking the boats on Cooper's Cove, and the Galloping Goose Trail. We're within a short walking distance to Fuse's Waterfront Grill Restaurant & Rush Adventures Kayaking Tours. We experience fabulous sunsets from our west facing home. The natural beauty of the area is spectacular. We're close to natural wonders such as the Sooke Potholes, a popular swimming spot in the Sooke River. The Potholes can easily be reached by a half hour bike ride along the Galloping Goose Trail, which borders the property, and Matheson Lake is also accessible from the trail, an hour the opposite way. We'll serve you a full and wholesome country style breakfast where it suits you: outdoors on the patio or in the warm and cozy guest lounge. Eagle Cove offers absolute oceanfront accommodation at Otter Point, located on the spectacular south west coast of Canada's Vancouver Island... 8 km west of Sooke, and a scenic 45 minute drive from downtown Victoria. Complete privacy is assured in your self-contained beachfront suite with private entrance and washroom, kitchenette, telescope, TV, panoramic windows, and sundeck. Sleep, soothed by the sound of the surf, on two super long twin beds which can be kept separate, or pushed together. Eagle Cove features fabulous views of the Strait of Juan de Fuca framed by Washington State's snow-capped Olympic Mountains on the horizon. Enjoy wildlife visits. Our property is frequented by deer and abundant bird life. Not to mention the cove to explore, where all sorts of sea life reside. 10 km past Sooke on West Coast Rd. Modern home with panoramic ocean and mountain views, private entrances, sitting rooms, antique furnishings, and a hot tub. Complimentary bikes are also provided. 180� OCEAN VIEWS Overlooking the Olympic Mountains, the Strait of Juan de Fuca, and Sheringham Point Lighthouse. RELAX AND UNWIND on our 10 acre hobby farm located 10 minutes west of Sooke and 50 minutes west of Victoria, on fabulous Vancouver Island. PRIVACY & WESTCOAST LIVING second to none. Easy stroll to miles of rugged west coast beaches, incredible hiking & biking trails, and whale watching from shore.